A Freightliner Coronado on a service contract has been given the thumbs-up by a company that services the Victorian snowfields region. Freightliner came together recently to recognise and award their top achievers of 2017 in a glittering award ceremony in Melbourne. After raving reviews from customers, Freightliner is excited to announce that we will once again be taking ourselves on a roadshow around Australia for the Big Boy Toys customer loyalty events. Mick Grace knows he has one of the coolest jobs in the trucking world. White might be the colour of choice for plain fleet trucks, but a small amount of stainless steel and Dura-Bright alloys mean Greg Garrett’s Freightliners make white look good. The new Cummins X15 engine is now available with the Freightliner Argosy in addition to the Detroit DD15. Freightliner Trucks will be celebrating its 75th anniversary at the Brisbane Truck show this year from May 25th to May 28th 2017 and will be featuring something new and something old. 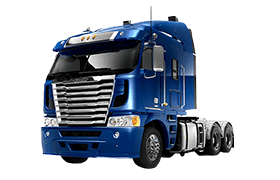 New to 2015 plated Freightliner Columbia is the factory supplied option Freightliner Roll Stability Control System (RSC). RSC reduces the risk of a vehicle rollover in extreme cornering or evasive manoeuvres, especially for vehicles with a high centre of gravity that are more susceptible. Quinn Transport and Spreading from Sorell Tasmania, use Freightliner Argosy to haul wood chips and sawdust from the southern end of the state to the export terminal at Bell Bay in the north through some of the world’s most scenic roads. The Argosy runs a 550 HP Cummins with 18-spead Eaton transmission. Unveiled at the 2014 Melbourne Truck show Freightliner Australia, celebrating 25 years in Australia, debuted the Freightliner Revolution Innovation Truck.